Momodora: Reverie Under the Moonlight is what happens when the Metroidvania and Soulslike genres meet. 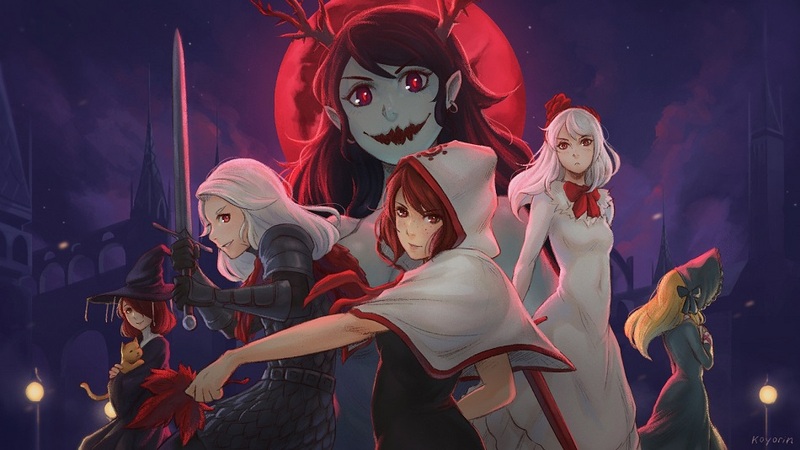 As a side-scrolling action game, Momodora features a vast, labyrinthine and interconnected world, countless bosses to defeat, a gothic atmosphere, and punishing difficulty. Unfortunately, it suffers from a lack of depth and a broken difficulty curve. The end result is a solid but deeply flawed adventure recommended for fans of the aformentioned genres only. In Momodora, players set out on an adventure as Kaho, a priestess who must rid the kingdom of an evil curse. That’s as much story as is required, although it does introduce a slew of side characters and micro-narratives, none of which really convey anything meaningful or moving. Players must collect power-ups and overcome bosses to arrive at the final confrontation. To accomplish these tasks, players have a number of base abilities like leaping chasms or reaching high platforms with a double jump. A roll lets players quickly get behind armored or shielded enemies. Players also use a magical leaf as a sword to slash at enemies, and a bow and arrow can be charged up to release three arrows at once. To this arsenal players can add additional powers, up to two active (as in, manually fired off) and three passives at any given time, provided the player has acquired them in the first place. These abilities are acquired either by finding them in the world or purchasing them from NPCs using star points, which can be collected from chests and fallen enemies. In addition, players can find countless vitality fragments around the world that increase their maximum health. These will prove increasingly important in order to stay alive against enemies that can kill players in a few hits. 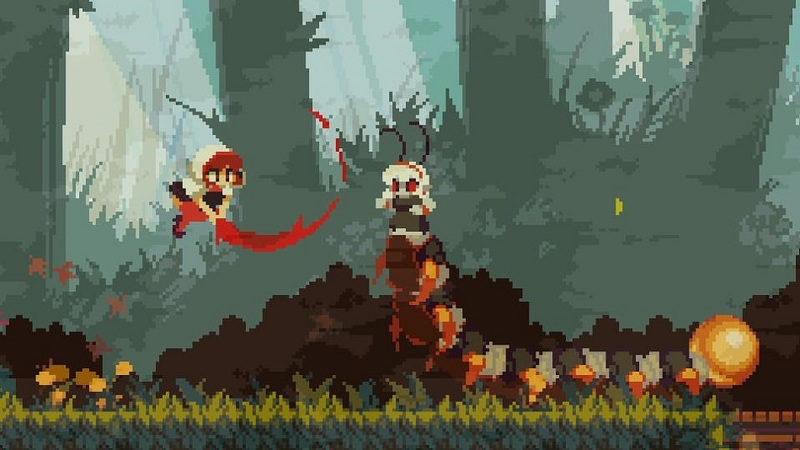 Momodora provides a healthy challenge, but sometimes this challenge feels excessive — respawning enemies, the overuse of poisonous bombs, darts, and gases, and the lack of health items early in the adventure meant that I ended up dying a lot during my first 30 minutes of playtime. I eventually started skipping combat encounters and running between save points, which take the form of prayer bells. Bells act as both locations to save progress and as fast-travel waypoints once that ability has been unlocked. This stiff difficulty extends to the game’s first boss fight, too. Momodora’s first big challenge can deplete almost all of the player’s health with just a few attacks. In this way, Momodora draws more than just its pixelated visual style from earlier eras of gaming — it also mimics their broken difficulty curves and poor design choices. The game rewards players paying careful attention to patterns, but punishes others with quick deaths. Players who love pattern recognition will appreciate this approach, but the rest will likely grow frustrated and quit. In an effort to deal with this problem, the game offers three difficulty modes. Unfortunately, Hard is near-impossible except for the best players, and Easy strips away all challenge. Moreover, Normal wasn’t a good middle ground since enemies still deal far too much damage. As it stands, it’s hard to recommend any of the modes since they all have serious drawbacks. Momodora’s open world features unlockable shortcuts that create a cohesive space and provide one more link between its design and that of the Dark Souls franchise. The world is gated with pathways that are too high to reach, that are too narrow, or that are blocked by overpowered enemies as a way of encouraging players to turn around and find another way forward until later. What’s frustrating is that enemies respawn when returning to an area, making backtracking and exploration tedious at times. I understand this has to happen in order to maintain the game’s economy (if enemies didn’t respawn, players would never earn enough star points to buy power-ups) but it means running around the dangerous world will always be an unpleasant experience. Sadly, if players manage to finish the game, the default ending fails to provide a satisfying conclusion. Without owning a special power-up, the adventure simply ends and players are told that they failed to save the kingdom. The catch here is that players are supposed to find a hidden item in order to secure the “good” ending, but this isn’t communicated at all. Again, this feels like the same underhanded tactics that older games would use in order to extend playtime or artificially create multiple endings. It’s a half-baked idea and it left a bad taste in my mouth. Disclosures: This game is developed by Bombservice and published by Playism. It is currently available on Windows, PS4, and Xbone. This copy of the game was obtained via publisher and reviewed on the PS4. Approximately 4 hours of play were devoted to the single-player mode, and the game was completed. There are no multiplayer modes. Parents: According to the ESRB, this game is rated T for Teen and contains violence and blood. Players attack enemies with a leaf sword, but nothing too graphic is presented. There are some sexually suggestive outfits on women characters which reveal cleavage. Deaf & Hard of Hearing Gamers: The game does not require sound. However, there is one special item, the Ring of Candor, that uses chimes to indicate when players are close to secrets, so using this item will be problematic.